Microalgae due to an array of its antioxidant, antimicrobial and anti-inflammatory bioactives have been changing the cosmeceutical market. One such bioactive power pack is Chlorella emersonii KJ725233, a novel, non-fastidious freshwater microalga with an inherently higher antioxidant potential. The present study evaluates its potential use as a cosmeceutical ingredient with arrays of biochemical assays, toxicity studies and GC-HRMS profiling. In vitro proteinase inhibition activity of the methanolic extract of C.emersonii KJ725233 was evaluated using SAAANA, sodium hyaluronate and bovine collagen as substrates respectively. The radical scavenging potential was determined by DPPH assay and was correlated to the total flavonoid content evaluated by aluminium trichloride method. The bioactive composition was evaluated by GC – HRMS analysis. Eye irritation potential and sulforhodamine B assay were carried out using 3T3 fibroblasts cells to ascertain its non-toxic nature. 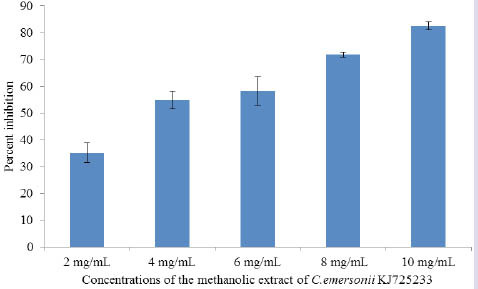 The methanolic extract of C.emersonii KJ725233 exhibited a potent elastase inhibition of 92.04±2.27% at a concentration of 1000 μg/mL. This was qualitatively established by the presence of phytol, its isomer and other anti-inflammatory molecules as revealed by GC HRMS profile. Its radical scavenging potential with an IC50 of 5.398±0.138 mg/mL exhibited a correlation coefficient of 0.9977 with its total flavonoid content. Toxicological studies on 3T3 fibroblast cell lines revealed its non – toxic as well as non – eye irritant nature. Its potential anti-aging and antioxidant activity coupled with its non-toxicity thus puts this microalga in the spot light for use in cosmeceutical industry. For this purpose, a variety of skin rejuvenation formulations containing ethanolamines, sodium lauryl sulphates, polypeptides or oligopeptides (copper peptides, palmitoyl pentapeptides), tretinoin etc. are available that are either aimed at improving the synthesis of the matrix proteins (except elastin) or inhibiting the proteinases.11,12,13,14 However, the inadequate efficacies of these formulations due to the variations in skin types coupled with an increase in consumer suspicion about their adverse effects (allergic contact dermatitis, irritant contact dermatitis, phototoxic and photoallergic reactions) eventually led to an incessant search for novel bioactives to replace their synthetic counterparts in the cosmetic formulations.11 The green cosmetic industry therefore, has been for long, leveraging on the bioactive power packs - algae as moisturizing as well as thickening agents.15 The secondary metabolites of microalgae with antioxidant, anticancer, antibacterial, anti-inflammatory, anti – aging, anti-allergic properties16,17 have made them an attractive alternative to their synthetic equivalents for cosmeceutical formulations. According to one of our previous studies, methanolic extracts of Chlorella emersonii KJ725233, an isolate from western Maharashtra, exhibited higher antioxidant capacity as compared to other solvent extracts18 and hence was subjected to an array of anti - aging and toxicity tests. The anti – aging potential was evaluated for elastase, hyaluronidase, collagenase activity inhibition assays. Radical scavenging potential was determined by 1,1-diphenyl-2-picrylhydrazyl radical scavenging assay along with its cytotoxicity by eye irritation potential and sulforhodamine B assay using 3T3 fibroblast cell line. Being a novel isolate it was also subjected to GC – HRMS analysis so as to identify its possible anti-aging constituents. BG – 11, calcium chloride and DPPH were purchased from HiMedia, India. Methanol, dimethyl sulfoxide (DMSO) and aluminium trichloride of AR grade were obtained from S D Fine-chem ltd., India. SAAANA, porcine pancreatic elastase, bovine hyaluronidase, p- dimethyl amino benzaldehyde, bovine collagen, N – [Tris(hydroxymethyl)methyl] – 2 – aminoethanesulfonic acid (TES buffer), ninhydrin, citric acid, sulforhodamine B, tween 20, triton X – 100 and sodium lauryl sulphate of molecular biology grade were procured from Sigma. All the tests have been performed in triplicate and the values are expressed as mean ± SD. The anti – aging activity was determined in terms of its in vitro elastase, hyaluronidase and collagenase inhibition activity. The anti – elastase activity was determined spectrophotometrically by using SAAANA substrate as described by Thring et al.7 Porcine pancreatic elastase enzyme was incubated with varying concentrations of the extract (100 μg/mL, 500 μg/mL, 1000 μg/mL). After 15 min of incubation the substrate was added and the reaction was further incubated for 30 min at 25°C. The absorbance was read at 410 nm. Epigallocatechin was assayed as a positive control. Anti - Hyaluronidase activity was spectrophotometrically determined by measuring the amount of N-acetyl glucosamine produced by the action of bovine hyaluronidase on sodium hyaluronate as earlier reported by Lee et al.19 Bovine hyaluronidase was added to varying concentrations of the extract (100 μg/mL, 500 μg/mL, 1000 μg/mL) and incubated at 37°C for 20 min. Hyaluronidase was activated by adding 12.5 mM calcium chloride to the reaction mixture and was further incubated at 37°C for 20 min. After the incubation, 1.2 mg/mL sodium hyaluronate was added and incubated at 100°C in a water bath for 3 min. The reaction mixture was allowed to cool at room temperature, after which 1.5 mL of p-dimethyl amino benzaldehyde was added to it and incubated at 37°C for 20 min. The absorbance was measured at 585 nm. Gallic acid was used as a positive control. Anti-collagenase activity was determined as earlier described by Mandl et al and Moore et al.20,21 Collagenase was incubated with varying concentrations of extract at 37°C for 30 min. To 25 mg of bovine collagen, 0.05 M TES buffer was added and incubated at 37°C for 15 min. After incubation, 0.1 mL of the treated collagenase was added to the collagen containing mixture and allowed to react. After 5 h, 0.2 mL of this reaction mixture was transferred to tubes containing 1.0 mL of ninhydrincitric acid mixture and was incubated in a boiling water bath for 20 min. After cooling 5 mL of 50% n-propanol was added to it and allowed to stand for 15 min. The absorbance was measured at 600 nm.. Catechin was used as a positive control. The radical scavenging potential was determined by using DPPH as described by Bendaoud et al.22 To 150 μL of extract concentrations ranging from 0.2 – 1 mg/mL, an equal volume of 0.2 mM methanolic DPPH was added. The reaction mixture was incubated in the dark at 28±2°C for 30 min. A graph of percent inhibition versus the extract concentration was plotted and IC50 was determined. The flavonoid content of the methanolic extract of C.emersonii KJ725233 was evaluated by the aluminium trichloride method.23 To 150 μL of the extract, an equal volume of 2% aluminium trichloride was added and incubated in the dark at 28±2°C for 30 min. The absorbance was read at 470 nm. Quercetin was used as a standard and the total flavonoid content was expressed as mg QE/g dried biomass. GC- HRMS analysis of all the methanolic extracts were carried out using GC (Agilent Technologies, USA) equipped with Accutoff MS. Compounds were separated on HP-5 MS capillary column having 5% phenyl polysiloxane as stationary phase, column length 30 m, internal diameter 0.32 mm and film thickness 0.25 μm. 1 μL of the methanolic extracts were injected in the split ratio of 10:1, the injector and transfer line temperature was 250°C and 260°C while the ion source temperature was 200°C. Oven temperature programmed from 80 to 280°C at 10°C min-1; flow rate of carrier gas helium was 1 mL min-1. Compounds were identified by comparing their retention times and mass fragmentation patterns with those of the standards at the NIST library. The methanolic extract of C.emersonii KJ725233 exhibited a significant anti – elastase and a modest anti – hyaluronidase activity however, its anti – collagenase potential was found to be less significant with a percent inhibition of 20.33±2.90% at 1000 μg/mL (Table 1) with an IC50 of 2.50±0.03 mg/mL (Figure 1). However, the present study is one of the first to report anti-collagenase activity of any microalga, signifying its potential in cosmeceuticals. The total flavonoid content of the methanolic extract of C.emersonii KJ725233 was determined by the aluminium trichloride method and was found to be 14.26±1.31 mg QE/g dried biomass i.e 158.09±0.23 mg QE/g dried extract which is 20.54% higher as compared to that of 131.15 mg QE/g dried extract of C.vulgaris.35 The coefficient of correlation for DPPH radical scavenging potential and total flavonoid content was found to be 0.9971 signifying the contribution of flavonoids to the radical scavenging potential of the methanolic extract of C.emersonii KJ725233. Since the methanolic extract of C.emersonii KJ725233 exhibited proteinase inhibition as well as radical scavenging potential it was thought worthwhile to identify the bioactives contributing to this activity. The methanolic extract was therefore, subjected to GC-HRMS analysis and the compounds were identified by comparing the mass fragmentation pattern with those in the NIST library as seen in (Table 2). The presence of several anti-inflammatory molecules in the methanolic extract may contribute to the anti-proteinase activity of C.emersonii KJ725233 since the proteinases elastase, hyaluronidase and collagenase are known to be involved in the inflammatory responses. Although the efficiency of bioactives in particular therapeutic approaches is imperative, its safety and absence of adverse cellular side effects is of utmost concern. Hence, along with cytotoxicity, assessment of irritation potential is a vital part of toxicology studies of new materials prior to consumer use. Percent inhibition of the proteinases at varying concentrations of the extract. Data is represented as mean±SD. p value<0.05 as compared to that of the control. Bioactives composition of the methanolic extract of Chlorella emersonii KJ725233 along with their retention times in minutes as well as area percentage. IC50 values for enzyme activity inhibition (Anti – Elastase: 0.49±0.1 mg/mL, Anti – Hyaluronidase: 1.58±0.06 mg/mL; Anti – Collagenase: 2.50±0.03 mg/mL). A graph of DPPH radical scavenging in terms of percent inhibition versus varying extract concentrations of methanolic extract of C.emersonii KJ725233. A graph of percent viability of 3T3 fibroblast cells after treatment with varying concentrations of the methanolic extract of Chlorella emersonii KJ725233. 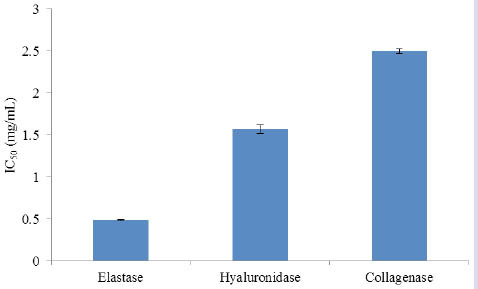 Comparison of the IC50 of the methanolic extract of Chlorella emersonii KJ725233 with those of the reference standards used - Tween 20, SLS and Triton X 100. Therefore, to analyze the safety of the methanolic extract of C.emersonii KJ725233 for use as a probable anti-aging agent its cytotoxicity was studied in terms of percent viability of the 3T3 fibroblast cell line (Figure 3) by sulforhodamine B assay. By plotting a graph of percent viability versus extract concentration the IC50 (Figure 2) was found to be 0.82±0.11 mg/mL. Thus the methanolic extract was found to exhibit cytotoxicity at concentration greater than 0.82±0.11 mg/mL. The eye irritation potential of the extract was determined in terms of the IC50 values derived from the dose response curves were graded in comparison with those of the reference standards (Figure 4). As per the Japanese Ministry of Healthcare and welfare guidelines for manufacturing of cosmetics and quasidrugs,25 comparing the IC50 value of the methanolic extract of C.emersonii KJ725233 with those of the reference standards, it can be concluded that it is practically a non – irritant since it has an IC50 higher than all the tested reference samples. The presence of anti – inflammatory molecules like phytol, its isomer and hydrocarbons, as revealed from the GC-HRMS analysis are known to reduce the proteinases activity thus reducing inflammation of the dermis. The anti – aging properties of Chlorella emersonii KJ725233 thus stem from its ability to inhibit elastase, hyaluronidase, and collagenase and to scavenge free radicals which might aid in supporting skin tissue leading to skin rejuvenation. Due to a plethora of compounds exhibiting anti – aging, antioxidant, anti – inflammatory properties; Chlorella emersonii KJ725233 has a great potential as a source of bioactive for cosmeceuticals. Gas Chromatography – High Resolution Mass Spectrometry. Ndlovu G, Fouche G, Tselanyane M, Cordier W, Steenkamp V , authors. In vitro determination of the anti-aging potential of four southern African medicinal plants. BMC Complement Altern Med. 2013. 13(1):p. 304–10. http://dx.doi:10.1186/1472-6882-13-304. Maity N, Nema NK, Abedy S, Sarkar BK, Mukherjee PK , authors. Exploring Tagetes erecta Linn flower for the elastase, hyaluronidase and MMP-1 inhibitory activity. J Ethnopharmacol. 2011. 137(3):p. 1300–5. http://dx.doi: 10.1016/j.jep.2011.07.064. Kurtz A, Oh S-J , authors. Age related changes of the extracellular matrix and stem cell maintenance. Prev Med. 2012. 54:p. S50–6. http://dx.doi:10.1016/j.ypmed.2012.01.003. Fulop T, Khalil A, Larbi A , authors. The role of elastin peptides in modulating the immune response in aging and age-related diseases. Pathol Biol. 2012. 60(1):p. 28–33. http://dx.doi: 10.1016/j.patbio.2011.10.006. Wary KK, Thakker GD, Humtsoe JO, Yang J , authors. Analysis of VEGF-responsive genes involved in the activation of endothelial cells. Mol Cancer. 2003. 2(1):p. 25–36. http://dx.doi:10.1186/1476-4598-2-25. Thring TSA, Hili P, Naughton DP , authors. Anti-collagenase, anti-elastase and anti-oxidant activities of extracts from 21 plants. BMC Complement Altern Med. 2009. 9(1):p. 27–37. http://dx.doi: 10.1186/1472-6882-9-27. Buhren BA, Schrumpf H, Hoff NP, Bolke E, Hilton S, Gerber PA , authors. Hyaluronidase: from clinical applications to molecular and cellular mechanisms. Eur J Med Res. 2016. 21:p. 5http://dx.doi: 10.1186/s40001-016-0201-5. Lee SH, Sancheti S, Sancheti S, Seo S-Y , authors. Potent antielastase and antityrosinase activities of Astilbe chinensis. Am J Pharmacol Toxicol. 2009. 4(4):p. 127–9. http://dx.doi:10.3844/ajptsp.2009.127.129. Mukherjee PK, Maity N, Nema NK, Sarkar BK , authors. Bioactive compounds from natural resources against skin aging. Phytomedicine. 2011. 19(1):p. 64–73. http://dx.doi: 10.1016/j.phymed.2011.10.003. Gancevicience R, Liakou AI, Theodoridis A, Makrantonaki E, Zouboulis CC , authors. Skin anti-aging strategies. Dermatoendocrinol. 2012. 4(3):p. 308–19. http://dx.doi: 10.4161/derm.22804. Robinson LR, Fitzgerald NC, Doughty DG, Dawes NC, Berge CA, Bissett DL , authors. Topical palmitoyl pentapeptide provides improvement in photoaged facial skin. Int J Cosmet Sci. 2005. 27(3):p. 155–60. http://dx.doi: 10.1111/j.1467-2494.2005.00261.x. Schagen SK , author. Topical peptide treatment with effective anti – aging results. Cosmetics. 2017. 4(2):p. 16http://dx.doi:10.3390/cosmetics4020016. Wang H-MD, Chen C-C, Huynh P, Chang J-S , authors. Exploring the potential of using algae in cosmetics. Bioresour Technol. 2015. 184:p. 355–62. https://doi.org/10.1016/j.biortech.2014.12.001. Abd EBH, El - Baroty GS , authors. Healthy benefit of exploring microalgal bioactive substances. J Aq Sci. 2013. 1(1):p. 11–23. https://doi: 10.12691/jas-1-1-3. Lee KK, Cho JJ, Park EJ, Choi JD , authors. Anti-elastase and anti-hyaluronidase of phenolic substances from Areca catechu as a new anti-ageing agent. Int J Cosmet Sci. 2001. 23:p. 341–6. https://doi: 10.1046/j.0412-5463.2001.00102.x. Bendaoud H, Bouajila J, Rhouma A, Romdhane M , authors. GC / MS analysis and antimicrobial and antioxidant activities of essential oil of Eucalyptus radiate. J Sci Food Agric. 2009. 89(8):p. 1292–7. https://doi: 10.1002/jsfa.3585. Colak N, Torun H, Gruz J, Strnad M, Hermosin-Gutiérrez I, Hayirlioglu-Ayaz S, et al. , authors. Bog bilberry phenolics, antioxidant capacity and nutrient profile. Food Chem. 2016. 201:p. 339–49. https://doi:10.1016/j.foodchem.2016.01.062. The Guidebook on application for the manufacturing of cosmetics and quasidrugs, Third Ed., Supervised by the Pharmaceuticals and Cosmetics Division, Pharmaceutical Affairs Bureau, Japanese Ministry of Health and Welfare, Yakuji Nippo Co, Ltd., 1996. Thomas NV, Kim S-K , authors. Beneficial effects of marine algal compounds in cosmeceuticals. Mar Drugs. 2013. 11(1):p. 146–64. https://doi:10.3390/md11010146. Imokawa G, Ishida K , authors. Biological mechanisms underlying the ultraviolet radiation-induced formation of skin wrinkling and sagging I : Reduced skin elasticity, highly associated with enhanced dermal elastase activity, triggers wrinkling and sagging. Int J Mol Sci. 2015. 16(4):p. 7753–75. https://doi:10.3390/ijms16047753. Chatzikonstantinou M, Kalliampakou A, Gatzogia M, Flemetakis E, Katharios P, Labrou NE , authors. Comparative analyses and evaluation of the cosmeceutical potential of selected Chlorella strains. J Appl Phycol. 2017. 29(1):p. 179–88. https://doi:10.3390/ijms16047753. Geetha BJ, Navasakthi R, Padmini E , authors. Investigation of antioxidant capacity and phytochemical composition of sun chlorella – an in vitro study. J Aquac Res. Development. 2010. 1:p. 104https://doi:10.4172/2329-6836.1000132. Ahmed D, Fatima K, Saeed R , authors. Analysis of Phenolic and Flavonoid Contents, and the Anti-Oxidative Potential and Lipid Peroxidation Inhibitory Activity of Methanolic Extract of Carissa opaca Roots and Its Fractions in Different Solvents. Antiox. 2014. 3(4):p. 671–83. https://doi:10.3390/antiox3040671. Hong W-H, Jung EY, Noh DO, Suh HJ , authors. Physiological effects of formulation containing tannase – converted green tea extract on skin care : physical stability, collagenase, elastase and tyrosinase activities. Integr Med Res. 2014. 3(1):p. 25–33. https://doi.org/10.1016/j.imr.2013.12.003. Jayshree A, Jayshree S, Thangaraju N , authors. Chlorella vulgaris and Chlamydomonas reinhardtii : effective antioxidant, antibacterial and anticancer mediators. Indian J Pharm Sci. 2016. 78(5):p. 575–81. https://doi:10.4172/pharmaceutical-sciences.1000155. Krishnamoorthy K, Subramaniam P , authors. Phytochemical profiling of leaf, stem and tuber parts of Solena amplexicaulis (Lam.) Gandhi using GC-MS. Int Sch Res Not. 2014. p. 1–13. http://dx.doi.org/10.1155/2014/567409. Peters RF, White AM , authors. The relationship between cyclic adenosine 3’,5’ - monophosphate and biochemical events in the rat skin after the induction of epidermal hyperplasia using hexadecane. Br J Dermatol. 1978. 98:p. 301–14. http://dx.doi: 10.1111/j.1365-2133.1978.tb06157.x. Hussein AO, Mohammed GJ, Hadi MY, Hameed IH , authors. Phytochemical screening of methanolic dried galls extract of Quercus infectoria using gas chromatography – mass spectrometry (GC – MS) and Fourier transform – infrared (FT – IR). J Pharmacognosy Phytother. 2016. 8(3):p. 49–59. http://dx.doi: 10.5897/jpp2015.0368. 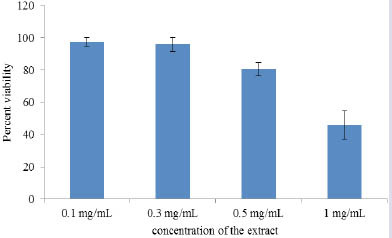 The methanolic extract of C.emersonii KJ725233 an antioxidant reserve exhibited a potent elastase inhibition potential. Additionally, it also demonstrated a substantial hyaluronidase as well as collagenase inhibition. This anti-proteinase inhibition potential can be attributed to the presence of anti-inflammatory molecules in the methanolic extract of C.emersonii KJ725233 as confirmed by GC-HRMS analysis. A compelling radical scavenging as well as elastase, collagenase inhibition may be accredited to the presence of flavonoids. 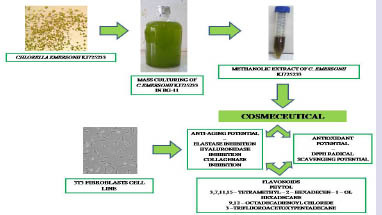 The antioxidant, anti-proteinase potential of methanolic extract of C.emersonii KJ725233 thus projects this alga in the limelight as an anti-aging resource. Ms. Sneha Sunil Sawant: Is a Research Scholar. She is currently working on the bio actives from freshwater microalgae; their metabolic responses under altered growth conditions as well as their remediation potential. Dr. Mrs. Varsha Kelkar Mane: Is a Senior Assistant Professor. She has been working actively in varied fields encompassing nanotechnology, algal bio actives, small molecular weight antimicrobial proteins and archival restoration.